The Replacement Wife, by Eileen Goudge, attempts to answer the question, “How would it work out practically if a wife with a terminal illness tried to select the one her husband should remarry after her death? Camille is a professional and very successful matchmaker. She has been to the weddings of many happy clients. So when she learned her cancer, which had been in remission, had returned and even spread, she began to lose hope that she would live to see her two children grow up. Her doctor gave her a 3% chance to live, and that was only if she submitted to another stem cell replacement transplant. She was not sure she wanted to go through that kind of fight again with so little chance of winning. She is so upset by the prognosis, that she stops off at a bar on the way home. Her physician husband Edward has left a message saying he has to work late again, and she knows the children are home alone, with her fourteen-year-old daughter in charge of her nine-year-old brother, Zach. Her memories flash back to her own childhood. Her mother had died when Camille was only fourteen, the same age as her daughter Kyra. Camille's father was a traveling man, gone three weeks of every month. Only their live-in housekeeper Rosa, who could barely speak English, was there for her and her eleven-year-old sister Holly. Her grandmother Agnes lived on the other side of the country. Agnes called often, suspicious that her son never seemed to be there. Camille had manufactured an imaginary friend of her mother's so she could give Agnes a name when she demanded to know who besides Rosa was looking after them. She was afraid of having herself and Holly reported as being left on their own and placed in foster care. She found herself taking charge of the household the way her mother had, making sure her father remembered birthdays, meetings with teachers, etc. She never wanted Kyra to have to go through what she did. Camille's husband Edward had been a rock to her during her illness. But that illness had also disrupted their relationship to the point where he no longer looked forward to going home. Camille's illness had been in remission so long he now felt things were finally able to go back to normal. While Camille had been getting her bad news, he'd been visiting a travel agent, getting information on places they might vacation to celebrate their approaching 20th anniversary. He felt that could be a new beginning for them. When Edward and Camille were finally alone after the children went to bed that night, Edward was devastated by Camille's news and he urged Camille to fight for her life. Camille was reluctant since there were no new experimental drugs she qualified to try. She had another plan. She decided she would use her professional skills as a matchmaker to find her replacement as Edward's wife and as a mother for her children. Edward was not receptive to this idea. He insisted he only wanted Camille. He was not eager to remarry. She insisted the children needed a stable life and someone there for them when they came home. She envisioned them coming home to an empty house as their dad continued to work late almost every night. She didn't want Kyra to have a childhood like hers. She insisted Edward come to the next “meet and greet” she threw for her single clients so that he might find someone. It all seemed very logical to her. What she hadn't counted on was the human element. People like making their own decisions. She also hadn't counted on getting into a new drug trial that put her cancer back in remission. You will have to read the book to find out what happened to all concerned. The plot intrigued me. What married woman with children would not wonder what would become of her family if she died? But I also wondered how trying to play God with relationships in this situation would work? It's one thing to know and even hope your husband would remarry. It's quite another to try to find another woman to marry him shortly after you are gone, and have her spending time getting to know your husband and children while you are still alive and watching everything -- even to have her along on family vacations. I would recommend this book to anyone who is intrigued with human drama, how relationships, marriages and families work, and what cancer patients experience not just physically, but emotionally. I believe the author took a question – How would it work if a wife picked her own replacement? – and turned it into a well-thought-through novel. I thoroughly enjoyed reading it, though I might have wished for a different ending. This is an excellent book review Barb. You definitely left me wondering about the ending. I haven't read the book, but I vaguely remember a movie with this plot. I remembered thinking then, as I do now, that choosing another wife for your husband or another mother for your children, would not be the way I would want to spent my last days on earth. While I get wanting to protect the people you love, I doubt I would be a better judge of a replacement wife than my husband would be. After all, he chose me originally. That's a great observation. I was not surprised by the ending, but I was kept guessing almost to the end. Keeping you guessing really is one of the best compliments a reviewer can give a book! wow, weird to think of picking your own replacement but stranger things have happened. Sounds like a great book, thanks for the review. I'm finding I really like this author. She takes up some interesting family themes. I just finished Wish Come True after this recent surgery. It was more of a murder mystery, but had another family theme. Very interesting story line and now you have me really wondering about the ending. 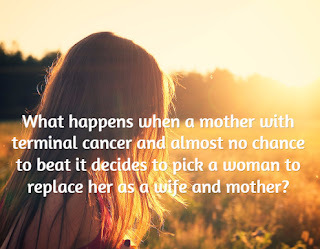 Having been a cancer patient myself, I actually can imagine wanting to choose a new mother for my children (if they were still young), more so than a new wife for my husband. Sounds like plenty of human emotions in this story. Excellent review!